Did you know you can wash your bras in a Zip-Lock bag? Pour a couple of cups of precious fresh water into a Zip-Lock bag, add a tablespoon or so of laundry soap (and whatever extras you normally use - I spring for an Oxy product), zip it shut securely, then put it in a sleeper cubby where the road turns and bumps will agitate it for the next day or so. Remove, rinse thoroughly, then hang in a well ventilated area until dry (include ample direct sunlight to the drying process if the article needs extra whitening). It can be very satisfying to creatively solve unexpected issues that crop up on a daily basis. Need room for an extra case of bottled water? If you've got a gap between your mattress and the wall, you can probably store the de-cased bottles there. Tired of sleeper stuff rattling and sliding around while you drive? Spend a buck at a dollar store for a roll of grippy shelf liner for a quieter ride. Helga, our first truck, had less than ideal refrigeration. I travel with meds that require constant fridge temps. If the meds freeze or go above a certain temp, they're useless. And these aren't "Gee, whiz, I need to throw these out and go pick up a new pack" meds - to replace just a month's supply would cost about $1,800.00. I wrapped each syringe in a paper towel to keep them from clattering together, wrapped them in a small, flexible blue ice blanket, then put them in a snap-lock, hard case insulated cooler sized to hold a single can of soda. Then THAT cooler was placed in a soft-sided, thick walled, insulated lunchbag with two small frozen blue ice packs. The whole contraption was then stored in the fridge. The idea was that the meds would maintain a cool temp during the periods when the fridge was without power. Did it work? Well, they never froze. Nor did they remain at a consistent temp. A few times, I pulled out a warmish syringe. After nearly a month of frantic worry about med temps (and un-cold OJ and cheese and ham), we came up with a better solution. We bought a 5-day cooler, hot glued plastic tubing to the drain, then put it under the bunk. The tubing exited through an existing hole in the sleeper flooring, allowing the melted ice water to drain on its own and freeing us from the daily hassle of emptying. The hard case of meds was sealed in a Zip-Lock bag and placed on top of the ice. With maybe 15 minutes of effort we had not only solved the med temp problem, but we'd improved our ability to safely store foodstuffs. Another simple, cheap fix that's made life easier for us is the addition of a small plastic basket above our bed to hold our phones, lip balm, change, etc. Our bunk doesn't have a shelf or cubby within easy arm's reach, and as expediters, our phones must be nearby at all times. We bought a narrow version, one that might be used to organize flatware in a drawer, with large openings on the sides. Our sleeper is finished with laminated walls, so we used a couple of Command Hooks hold the basket in place - if yours is carpeted, you could achieve the same using drapery pins. Here's a prediction: Velcro will become your new best friend. 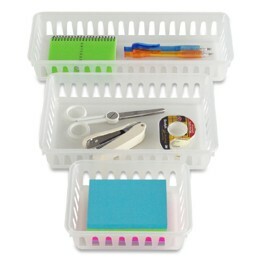 Use it to tack things in place on flat surfaces, or to keep organizer drawers shut. Ignore the designer's intent for a space and use your imagination. Books, maps, and magazines lay flat, so they can go in the bottom of a drawer under the things you normally keep in there - or you can slip them under the mattress. Our sleeper has a floor to ceiling narrow closet, about 9" wide, with a large shelf separating it into upper and lower halves. It was meant to be used for hanging clothes, but its convenient location (and our nonexistent inventory of clothes that need hanging) meant that we used it for other storage, such as our laptops, packages of freight bill and driver log blanks, laundry soap, shower totes, etc. Each half offered a lot of valuable storage space, but the height inside meant that items needed to be stacked and piled atop one another. Hoss cut two plywood shelves to fit and we now have twice the storage space in that closet, and it's a heckuva lot easier to get things out and put them away, too. Buy plastic dishpans at the dollar store that fit your cubbies and keep your socks, t-shirts, and skivvies in them for efficient organization. Why root around over your head through a perpetually tangled wad of clothing for that pair of socks when you can just pull out a tub, grab what you want, and put it back? If your mattress is a non-standard size, you don't have to put up with oversized sheets that untuck and bunch up every time you crawl in the sack. Break out the sewing machine (or borrow one) and a tape measure, and make your own fitted sheets. It's easier than you think - if I can do it, anyone can. Or just sweet talk someone into doing it for you. Sleeping on nicely fitted sheets is worth it. So keep an eye out for bargains on Command Hooks, over the door hooks, bungee cords of all sizes, Velcro (especially the heavy duty automotive style), and suction cups, as well as wire and plastic racks, baskets, bins and organizers. Think creatively and have fun!